A clear, slightly pale cup with a fresh aroma and a smooth velvety flavor. Delicate jammy notes reminiscent of Keemun or a mild Bordeaux. Manufacture Type(s): Non fermented, Traditional process, Naturally withered and dried, Small batch crafted, Hand sorted. Cup Characteristics: Clear slightly pale cup with a fresh aroma and a smooth velvety flavor. Delicate jammy notes reminiscent of Keemun or a mild Bordeaux. This is the highest grade of white tea available before one enters the stratosphere in pricing for white teas such as Peony White Needle Tea. Pai Mu Tan leaves are plucked from a special varietal tea bush called Narcissus or chaicha bushes. Secondly the leaves are not steamed or pan-fired (the process used in green teas). The leaves are naturally withered and dried in the sun. If mechanical drying is required it is a baking process at temperatures less that 40˚C. Thirdly only special ‘two leaves and a bud’ are selected. These leaves must show a very light green almost gray white color and be covered with velvet peach fuzz down. White teas that are withered in conditions that are too hot with become reddish and in conditions that are too cold they will become blackish. You will see on this Pai Mu Tan that the tea maker struck the perfect balance between solar and indoor withering resulting in a perfect white tea. The western cosmetic industry has recently discovered the benefits of white tea. In addition to its anticancer properties, tea has a calming and detoxifying effect on the skin. 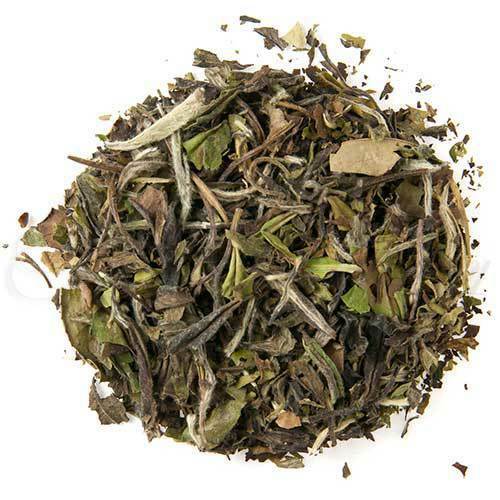 White tea is especially potent in that it is has three times as many antioxidant polyphenols as green or black tea and has been shown to be 100% more effective in mopping up free radicals that cause skin to sag. Some of the world’s top cosmetic companies are becoming very interested in white tea for skin creams and the result is that high grade white tea is becoming even more rare than before.